With conventional publishing timelines of 12 – 18 months, expert insights into the future and the concerns of future thinkers are likely to be delivered far too late for decisive action. The acclaimed futurist and regular speaker at NextGen events, Rohit Talwar, master-minded production of this impressive work in just 19 weeks. In that process from conception in January to launch this week, Rohit and his team adopted a new business model – one that they hope will lead to many further productions of high quality material. 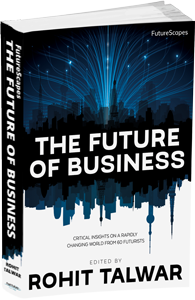 The Future of Business is exclusively available for order via Fast Future Publishing 2015 – the venture they created in January to tackle the logistics of making their dream a reality. In 62 chapters bringing together 60 contributing authors from across 21 countries, the Future of Business explores how the commercial world is being transformed by the complex interplay between social, economic and political shifts, disruptive ideas, bold strategies and technological & scientific breakthroughs. At first sight readers might be daunted by these 566 pages but, edited into 10 sections with chapters averaging 9-10 pages, readers will find it easy to find topics of immediate interest – aided, no doubt, by the online references that perform so much better than printed versions ever could. The book is aimed at the leaders of today and the pioneers of tomorrow – raising awareness of the issues that will confront us long before we are knocked sideways by the supposedly unexpected. Our future, your future, is not pre-destined but the awareness that society, businesses and individuals can identify and exercise those choices is rarely apparent in life’s daily grind. If the Future of Business raises your sights and stretches your imagination, then the entire collaborative production process will have been well worth the effort. 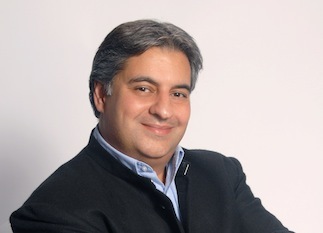 Rohit Talwar has been a star speaker at many NextGen Events. ← How many holes in Blackburn, Lancashire – or anywhere else?